Tomorrow? Shop Small starts on Saturday. Found on mine too. Heat added. Thanks. Just on one of three cards this time (has previously been on all three when they've run this offer a couple of times before). Worth getting a £10 One4All gift card that can be converted to Amazon credit (EDIT: As PhoenixRising points out, they've stopped allowing Amazon now, full list of retailers is here) or spent in quite a range of shops and restaurants. Thanks. Just on one of three cards this time (has previously been on all …Thanks. Just on one of three cards this time (has previously been on all three when they've run this offer a couple of times before).Worth getting a £10 One4All gift card that can be converted to Amazon credit or spent in quite a range of shops and restaurants. One4All doesn't allow conversion to Amazon credit any more. They stopped this a few weeks back. One4All doesn't allow conversion to Amazon credit any more. They stopped …One4All doesn't allow conversion to Amazon credit any more. They stopped this a few weeks back. Not for me this year. Reckon this would work for Royal Mail from a post office? I.e. for postage and stamps? Reckon this would work for Royal Mail from a post office? I.e. for postage …Reckon this would work for Royal Mail from a post office? I.e. for postage and stamps? Thanks, got this one two cards, but not on my wife's supplementary card. Hopefully a manual add later, but maybe last year it was offered later on supplementary cards? On all 3 cards, excellent heads-up OP. Can it be £10 or does it need to be 10+ please? So a £10 One4all giftcard is a perfect spend. I've activated the Shop Small promo, same as last year. Presumably it's not ANY Post Office? None listed on mine, sadly, out of the 100 participating businesses. I've activated the Shop Small promo, same as last year. Presumably it's …I've activated the Shop Small promo, same as last year. Presumably it's not ANY Post Office? None listed on mine, sadly, out of the 100 participating businesses. shop small is different, post office have there own offer now. On both my cards - promptly loaded Shame the Amazon cash out on One4All isn't an option anymore - but its still a good saving as 1ForAll is valid at a lot of other good places. Thanks OP. not in my amex offers, had this last year but not this year. its not the same as shop small promo. you should see it as an individual offer. Not listed on my local ones either, they don't accept Amex which is probably why. £10 is fine.So a £10 One4all giftcard is a perfect spend. It's worth bearing in mind that One4All charge 90p per month for cards not used after 18 months. I realise this is offer is just £10 in this instance, but it's worth keeping this charge in mind if you're 'stocking up' on One4All Giftcards. It's worth bearing in mind that One4All charge 90p per month for cards not …It's worth bearing in mind that One4All charge 90p per month for cards not used after 18 months. 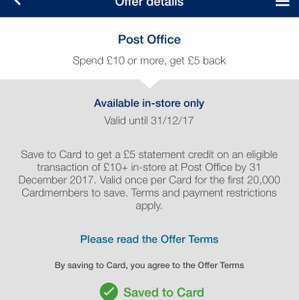 I realise this is offer is just £10 in this instance, but it's worth keeping this charge in mind if you're 'stocking up' on One4All Giftcards. I wish you could stock up, but sadly limited. Thanks, saved it to my card! Buy a £10 One4All gift card you can use it at so many places. Anyone got a link for the MBNA card please? Buying stamps must be the best pension investment you can make, proces seem to be forever shooting upwards. Thanks for the heads up. Loaded to both main and supplementary Platinum cards.